Mount Gravatt Central. Logan Road looking south. 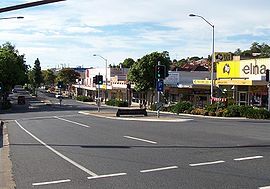 Mount Gravatt is the name of both a major suburb of Brisbane, Queensland, Australia and a prominent hill in this suburb. The suburb is situated in the south-east of the city and was one of Brisbane's largest. This was before it was divided into Mount Gravatt East, Upper Mount Gravatt and Mount Gravatt South; the last being changed to Wishart in the early 1990s. At the 2016 Australian Census, the suburb recorded a population of 3,366. Between 1953 and 1969 electric trams ran from the suburb into Brisbane's Central Business District (CBD) along Logan Road. As Mount Gravatt was the end of the line, part of the area was known locally as "The Terminus". The Mount Gravatt Library opened in 1967. Since the closure of the tram network, the public transport has been provided by buses operated by Brisbane Transport and a local bus company the Mount Gravatt Bus Service. The South East Busway is connected by a service from Mount Gravatt Central to the Busway terminal at Griffith University. The Mount Gravatt Showgrounds are an important centre for cultural and community activities and the site of the annual Mount Gravatt Show, an agricultural fair. The grounds are positioned on Logan Road, opposite the mega-church, Hillsong Brisbane Campus (formerly known as Garden City Christian Church). The Brisbane City Council operates a public library at 8 Creek Road. Mount Gravatt Lookout is accessible via Shire Road which winds its way past water towers up to the lookout carpark and a communications tower. Furthermore, there is a large cave complex located on a walking trail on the southern slope of the mountain (Latitude: 27.544184º S Longitude:153.076841º). The suburb is populated by middle class, young families seeking stability. Mount Gravatt was once a popular destination of German, Irish and English Immigrants to Australia after World War 1 and 2. The suburb has a growing number of Southern Europeans (mostly from Greece and Italy). In Mount Gravatt common birthplaces outside of Australia included New Zealand 3.2%, England 3.1%, India 2.1%, China (excludes SARs and Taiwan) 1.0% and South Africa 1.0%. Languages other than English spoken at home included Arabic 1.1%, Mandarin 1.0%, Punjabi 1.0%, Greek 0.7% and Italian 0.7%. Griffith University has its main campus in the suburb. Mount Gravatt State High School and Mount Gravatt State School. Mount Gravatt State School was opened on the 29 June 1874. Mount Gravatt East State School was opened on 29 August, 1955. Easts Mt Gravatt rugby league club. Mount Gravatt Australian Rules Football Club in the Queensland State League. The club were premiers in 2007. The Mount Gravatt Hawks Soccer Club plays in the Brisbane Premier League. ^ a b Australian Bureau of Statistics (27 June 2017). "Mount Gravatt (State Suburb)". 2016 Census QuickStats. Retrieved 29 March 2018. ^ "Holland Park Ward". Brisbane City Council. Brisbane City Council. Archived from the original on 12 March 2017. Retrieved 12 March 2017. ^ a b "Queensland Places". Archived from the original on 7 January 2011. ^ Appleton, Richard and Barbara (1992). The Cambridge Dictionary of Australian Places. Melbourne: Cambridge University Press. ISBN 0-521-39506-2. ^ "Public Libraries Statistical Bulletin 2016-17" (PDF). Public Libraries Connect. State Library of Queensland. November 2017. p. 11. Archived (PDF) from the original on 30 January 2018. Retrieved 30 January 2018. ^ "Mt Gravatt Showgrounds". Archived from the original on 22 February 2017. ^ Timms, Duncan (1975). The Urban Mosaic: Towards a Theory of Residential Differentiation. CUP Archive. p. 112. ISBN 0521099889. Archived from the original on 24 February 2017. Retrieved 20 October 2013. ^ "2011 Census QuickStats: Mount Gravatt". quickstats.censusdata.abs.gov.au. Retrieved 19 April 2019. ^ "Mt Gravatt Vultures". Archived from the original on 6 November 2016. ^ "AFL Queensland Premiers". Archived from the original on 22 February 2017.